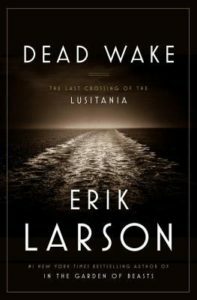 Dead Wake is a non-fiction account of what happened to the Lusitania, the ocean liner sunk by a German u-boat that led to the the United States joining WWI. That was the extent of my knowledge about the topic prior to this book. I remember learning about the sinking of the Lusitania in high school but like most US history classes, we were racing through the 20th century at the end of the school year so it was a footnote, along with the Zimmerman Telegram which is also a part of this book. The thing about this book, and I think one of the author’s strengths in general, is the way in which he talks about something big while still keeping the focus on the smaller things. This book is about the sinking of a ship but Larson spends most of the book talking about the people who were on the ship, how they got there and who they were. He describes the captain of the ship (and the captain of the u-boat) in great detail that allows the reader to, in essence, have a relationship with him. Then, he also describes the implications that surround the attack like the intelligence that was gathered and how it affected global politics. Larson magnificently relates the big picture to the small and makes the reader feel invested in the story. I really appreciated Larson’s discussion of the myriad of conspiracy theories that surround the disaster. He doesn’t just drop them on you lap but weaves information throughout the narrative so that the discussion is fully developed before it even arrives. I read this book because I have enjoyed others by Erik Larson and Dead Wake met all expectations. If you like his work, you’ll like this one too.